The Fujifilm Finepix XP30 is an outdoor lover's new best friend. After owning and using a DSLR camera and a normal compact camera, this year I want something that is different. 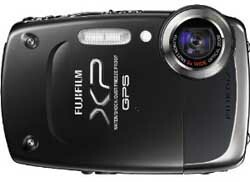 The Fujifilm FinePix XP30 speaks just that; it’s an easily operated compact digital camera made to be used outdoors. For those who own a DSLR camera, you'll know that although the camera takes perfect shots, it can be really awkward sometimes to bring the camera with you on outdoor activities. Not only is it heavy to carry around it’s also too expensive to bring to fun outings where it might get damaged. Just How Useful Is The Fuji XP30? The FinePix XP30 comes with GPS features, which is excellent to use when on a trekking trip in the mountains or on a wild outdoor adventure. The XP30 is a leader in the digital camera market for rugged outdoor compacts and it also bears the title of being the world's first water, shock, dust, and freeze proof model with built-in GPS functionality. I’m not intending to replace my DSLR camera, but I’m an outdoor person who just loves action packed activities. The FinePix XP30 is perfect for me to take on my multiple outdoor excursions. It gives me a chance to document my wild open-air moves with its 14.2 megapixel resolution and 5X optical zoom without the need to worry about the camera getting broken or damaged. To also have the GPS Tracking Data functionality on this camera is like the icing on the cake. With the GPS feature built in, I will be able to keep track of my journeys in the great outdoors by using GPS tagging. The built-in GPS functionality will also let me know my location on an outdoor adventure. The FinePix XP30 by Fujifilm is perfect for those who just can’t get enough of the active outdoor lifestyle. Find out more about the first outdoor rugged compact right here. The Finepix F10 is a great choice if you want a low cost point and shoot camera that delivers high quality results in low light conditions. The Fuji S700 is designed to be a relatively low cost, high quality camera for basic artistic and professional photography. The Finepix Z1 is a good camera for those who want a stylish look and a range of simple, automated functions. There is a wide range of Fuji digital camera accessories available, including waterproof and dust proof cases, power adapters and extra rechargeable batteries, HDTV compatibility equipment and more.